Your money or your data. Cybercriminals are forcing some companies to make the choice: Either send money or risk a distributed denial of service (DDoS) attack, which can take down company IT systems, disrupting infrastructure or services and resulting in significant losses across the organization. Corero research has shown that DDoS attacks increased by 35 percent in 2017 from the previous year and are becoming more sophisticated, with tools and techniques evolving alongside the explosion of vulnerable internet of things (IoT) devices hitting the market. DDoS-for-Hire services are a significant factor in the increase in attack activity. For the right price, anyone can make a payment and name a target and a crippling attack is launched. It has become that easy. While DDoS attacks can be attributed to someone wanting to send a big message or with an ideologic view, organized crime has now discovered its uses and the profitability that comes with it. The big shift has been toward financially motivated attacks, with significant increases in extortion and ransom threats. Greater awareness of this evolving plague started with the Mirai code, which was used to search and identify IoT devices that could be recruited into a giant botnet used to launch huge DDoS attacks. Just over a year ago, the market was forced to acknowledge this threat vector, when domain name service (DNS) provider DYN was attacked by a complex DDoS attack that impacted dozens of internet platforms and services such as Twitter, Spotify, Reddit, Netflix and others. Once Mirai’s author made the code public, the DDoS landscape was changed forever. Mirai has spawned myriad variants including Okiru, Satori and now Matsuta. This new dawn of opportunities for the cybercriminal community demonstrates how hackers typically start with the path of least resistance and, when that becomes blocked, look for the next easiest path. Early reports of a new botnet variant named “Masuta” show how the initial Mirai simple password brute-force methods, which are still employed, are now being supplemented with more sophisticated vulnerability exploits. Satori targeted Huawei routers, and now the Okiru code has opened up a whole new group of devices which can be recruited into botnets—from cars to phones to TV cameras and more—by targeting ARC processors, which are embedded in more than a billion products per year. This progression is enabling a broader range of devices, from a wider range of more well-known vendors, to be recruited into botnets, ready to be exploited for various nefarious purposes, including DDoS attacks. Once a botnet has been herded, cybercriminals select from the myriad of delivery mechanisms, such as pulse-waves, floods, reflection, amplification or any other of the many DDoS attack vectors. Pulse-wave attacks are gaining favor, as they enable perpetrators to attack multiple targets, one after each other, with short high-volume bursts in a rapidly repeating cycle. They can ramp the attack traffic faster and increase the chances of evading legacy protection on a network. Short Duration attacks are often combined with more calculated, sub-saturating traffic volumes, rather than using massive brute-force attacks. These short duration, surgical attacks are often crafted specifically to fly under the radar of conventional DDoS protection, as they can blend in with regular traffic volumes. DDoS attacks are being used for a variety of purposes, but now, more than ever, they are leveraged in conjunction with other attacks. Similar to a slight of hand, while the target organization focuses on the ramifications of the DDoS attack, other attacks are launched to infiltrate the network and carry out activities, such as exfiltrating valuable data. The increase in DDoS attacks, combined with their possibly devastating impact, has been the driver for many companies to redefine and standardize the way they manage their connections to the internet. These so called next-generation internet gateways include next-generation firewalls and the latest always-on DDoS mitigation, with corporate policies designed to enable access to the internet that is designed, managed and monitored in a repeatable manner. So many organizations now rely on their Internet presence to do business and the only safe approach to ensuring continuous online availability is to include real-time, automatic, DDoS protection as part of a next generation defense. It’s 2018 folks, where everything has to be high-tech and the internet of things grows by the day. And where there is IoT, there is malware. Cyber criminals can use your smart home appliances and turn them into craptocurrency miners. First world problems, am I right? Cybersecurity expert and VP of tactical analysis for Stratfor, Scott Stewart said that homes with a high amount of IoT appliances could be at a high risk. Just imagine, your toaster, oven, washing machine, dryer AND fridge – all being hijacked for their processing power to mine some suckers Bitcoin and you’re left with slow, useless utilities. And it also appears that botnets are already running on owners home appliances to be used for denial of service attacks. Not only are you being coined out of your craptocurrency, now you’re helping scriptkiddies around the world take their Xbox enemies offline! How appliances have advanced! He was also quoted mentioning “We’re also concerned though not only for use in DDoS and the ransomware application, but also Bitcoin mining and other coin mining.” and “So people could take over your appliances and use them to make Bitcoin, which is crazy. But it is what it is”. Imagine if within years, you have a fully automated “IoT” styled house, just for everything to become infected and for your home to be turned into a literal “mine”. He was also saying how hackers will be looking for new malicious ways in 2018 to present themselves as threats to cybersecurity. And how he recommends that users make sure they are using a secured network to make sure that they aren’t put at a higher risk to attack. IoT have already caused a lot of issues concerning privacy, interoperability and standards, legality and rights and the ever evolving development of them. However one thing that hasn’t always been at the front line is the fact that the security of these things are at a lot higher risk than just using them to eaves drop on your “good morning” conversations. The impeding message too the public when being sold these “smart” appliances is how there is risk of infection software wise and what the signs are. Someone could be sitting at home, happily using their “smart” appliances while they’re not operating at max capabilities because some hacker is using majority of the processing power to mine craptocurrency for them. People need to think about the cybersecurity of not just there computers and phones now, they also have to think about any “smart” appliances that in my opinion are just about to become dumb. NEW BRUNSWICK, NJ – The ​academic information of 1,700 Rutgers students was exposed during a “data security incident” on November 8 and 9, university officials confirmed. No one’s Social Security number, address or financial information was leaked, according to university spokesperson Neal Buccino. Instead, the affected students, all in the Department of Computer Science, had their academic data leaked, including Rutgers ID numbers, cumulative GPA’s and Spring 2018 class schedules, Buccino said. University officials notified those students affected that their data was exposed, but that it hadn’t been altered, according to Buccino. Officials determined that 18 students accessed the data “in error,’ and notified those students th​a​t​ information they viewed was confidential. The leak was the result of an “administrative error,” according to Buccino, who added that the university was updating its relevant security policies to ensure such an error doesn’t happen again. Internet issues are nothing new to Rutgers. Over the course of 2015, Rutgers suffered half a dozen distributed denial of service (DDOS) attacks which crippled the internet on campus for days at a time. The attacks were perpetrated by the so-called “exfocus” hacker, who during the course of the attacks posted a series of taunting messages on various Twitter pages. Two of the major attacks took place in the Spring 2015 semester; one during midterms and the other during finals period, preventing many students from working on projects and papers, or preparing for exams. However despite all this, the adoption of this Machine Learning is still relatively low amongst companies in the tech landscape (Gartner estimating that fewer than 15 percent of enterprises successfully get machine learning into production). And even when you hear about Company X adopting a machine learning strategy, it’s often conflated with another strategy or service within that company, and not truly realizing the automated ‘adaptiveness’ inherent within ML. Those companies that do realize a proper machine learning strategy, understanding and grooming their data as well as identifying the appropriate model/s can see real benefits to their operations, which is why DOSarrest has been developing such a strategy over the last year. Here at DOSarrest, we’ve been focusing on building an Anomaly Detection engine, focusing on the constantly evolving sophisticated application layer attacks. We collect huge amounts of data from disparate sources (e.g. Customized web logs, snmp and flow data, IDS logs, etc. ), even when customers are not under attack. This provides an opportunity to identify baselines even in a multi tenant environment. As you would expect, there is a high degree of cardinality within some of the data fields, which can be challenging to work with when working with data in motion, but can have great benefits. With these huge structured data sets, we are able to identify KPI’s (Key Performance Indicators) and statistics that can be leveraged by the engine to identify anomalous behavior and brought to the attention of the Security Ops team, who are then able to investigate and act on the identified pattern. The engine continues to refine the probability of a metric, becoming more accurate over time in determining the severity of an anomaly. The strategy holds great promise, and further developments and refinements to this model will continue to evolve the best Security Operations Center in the business. A more detailed view of an anomaly – this shows a single IP requesting more than 60 times more frequently than a normal visitor. This screen gives an overview of any anomalies, organized by relevant factors. In this case the remote IP address of the requestor. During the past week, there has been a sudden surge in online extortion campaigns, against regular users and security researchers alike. The most devious of these was a campaign detected by Forcepoint security researcher Roland Dela Paz, and which tried to trick users into thinking hackers had gotten their hands on sensitive or sexually explicit images. Attackers wanted payments of $320 to a Bitcoin address or they would have sent the compromising materials to the victim’s friends. This attempted blackmail message was the subject of a massive spam campaign that took place between August 11 and 18. Dela Paz says attackers sent out extortion emails to over 33,500 victims. Most of the targets were from Australia and France. 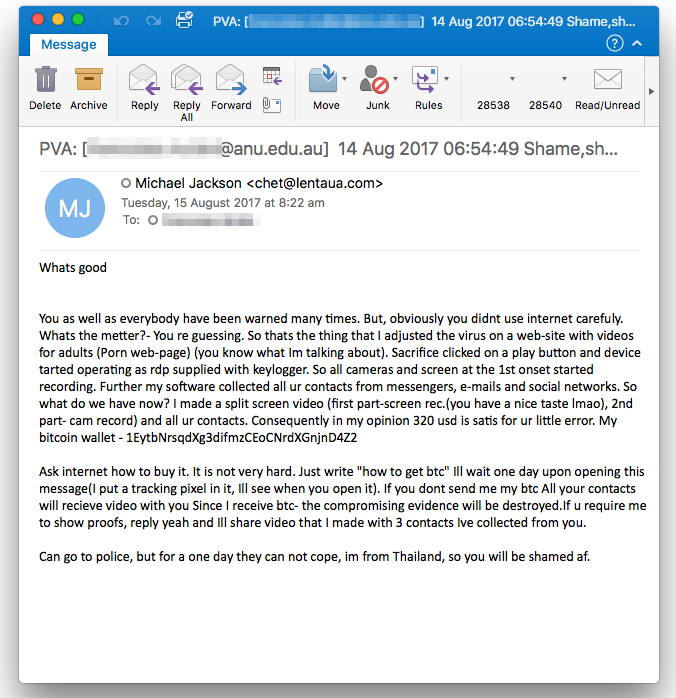 The extortion campaign was particularly active in Australia, where it caught the eye of officials at the Australian National University, who issued a safety warning on the topic, alerting students of the emails. The extortion attempt was obviously fake, says Dela Paz. In addition, during the past week, there were also extortion attempts sent to organizations. A hacker group calling itself ANX-Rans tried to extort a French company. Another group calling itself CyberTeam also tried to extract a ransom payment of 5 Bitcoin (~$20,000) from Abuse.ch, the website of a prominent Swiss security researcher. These DDoS threats in the hope of extracting Bitcoin payments are called DDoS-for-Bitcoin or RDoS (Ransom DDoS) attacks. RDoS attacks have been on the rise since mid-June after a South Korean hosting provider paid a ransom of nearly $1 million after web ransomware encrypted its customer servers. Ever since then, RDoS groups became extremely active hoping for a similar payday. We’ve already covered the active groups at the time in an article here. Since then, the most prominent RDoS campaign that took place was in mid-July when a group using the name of the Anonymous hacker collective tried to extort payments from US companies under the threat of DDoS attacks. At the time, Bleeping Computer obtained a copy of the ransom email from cyber-security firm Radware, who was investigating the threats. Radware said that despite posing as Anonymous hackers, this was the same group who tried to obtain ransoms of $315,000 from four South Korean banks (for these RDoS extortions the group posed as Armada Collective, another famous hacking crew). “This is not an isolated case. This is a coordinated large-scale RDoS spam campaign that appears to be shifting across regions of the world,” Radware security researcher Daniel Smith told Bleeping Computer via email at the time. The group also claimed it was in control of a Mirai botnet made up of compromised IoT devices and was capable of launching DDoS attacks of 1 Tbps. No such attacks have been observed following the ransom demands on US companies. In research presented at the USENIX security conference last week, researchers from Cisco, Akamai, Google, and three US universities revealed that despite having a reputation of being able to take down some of the largest online companies around, the most variants of the Mirai botnet were mainly used to target online gaming servers. Most of these DDoS attacks on gaming servers were also relatively small as multiple botnets broke up IoT devices (DDoS resources) among them. In addition to the group posing as Anonymous, Radware also reported on multiple RDoS extortion attempts on gaming providers that also took place in July. “We suggest companies do not pay the ransom,” Smith said at the time, a recommendation still valid today, as this encourages more blackmailers to join in. Games company Blizzard has reported on Twitter that: “We are currently monitoring a DDOS attack against network providers which is affecting latency/connections to our games.” World of Warcraft, Overwatch, Hearthstone and other game servers are believed to have been hit. At about 5pm last night Blizzard noticed Down Detector – which monitors online outages -logging a huge upsurge of problems and 2800+ reports for Overwatch, World of Warcraft and several other Blizzard gaming services. Commenting on the way that even failure to bring a service down completely has a severe impact on online games, Igal Zeifman, director at Imperva Incapsula said in an email to SC: “Competitive online games are an attractive target for any DDoS offender looking to create large-scale mayhem in hope of some Internet notoriety. Moreover, such gaming networks are also particularly vulnerable to denial of service assaults because, unlike many other targets, they don’t need to be taken offline to become unusable.